Binoculars are often associated with nature lovers or birdwatchers, who you always see with a pair in their hands or around their necks. However, this is not a general rule. In fact, these optical gadgets can work a long way – landscape photography, traveling, festivals, football games, theater shows, stargazing and so on. Apart from photography and planning, binoculars can enhance a series of life experiences and bring you close to the action. In fact, if you have a pair around, chances are you'll always find something to peek on. But then, with so many options around, it's certainly hard to spot the best travel binoculars. The size and optical design are some of the first considerations. Most people opt for small units that can easily fit into their pockets or purses. 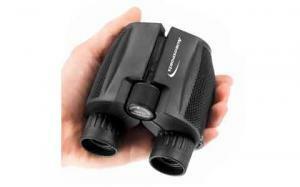 If you plan to use binoculars for work or wildlife, you can also opt for a larger size. The object lens size is just as important. It's normally given in mm and is directly responsible for the amount of light allowed inside the unit. Unless you need this pair for theater performances and football games, the field of view can easily add to the overall experience. The wider it is, the easier it becomes to spot small objects. In terms of features, bells and whistles don't overlook the build quality, waterproofing features (in case you'll use the binoculars outdoors a lot), and location of focus wheel, image stabilization and strap. Once you have all these covered, deciding on the best travel binoculars becomes a matter of time only. It does pay off to go with a reliable manufacturer rather than a newly established one for some obvious reasons – more experience and a better service. Now, what are the best-selling travel binoculars on the market and what makes them so special? 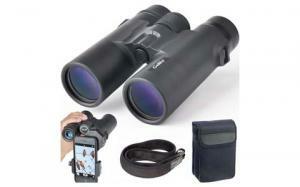 The folding binoculars from Aurosports represent one of the best rated units in this industry. It's easy to tell why. This model is advertised to be helpful in bird watching, nature activities, outdoor sports, concerts, games and so on. Basically, it’s a general set that will not disappoint. Its size is by far the main reason for its popularity. It's compact and lightweight – weighs less than a pound. It can easily fit in one hand, so you can keep it in a large pocket or your purse. It's also suitable for kids, regardless of what they want to watch. In terms of performance, the BAK4 prism objective lens measures 25mm. It has a full HD green film, so it ensures a perfect light transmission – up to 99.5%. There are no doubts about the brightness either. One of the most attractive features is the Low Light Night Vision. It works wonders at sunset and even after, but keep in mind that it's not a military item, so it won't work in complete darkness. The waterproof capabilities are not to be overlooked either. However, keep in mind that you can't soak the binoculars in water or use them in heavy rain for too long. The view field and focus capabilities go up to 1000 yards in distance. It has 10x magnification as well, while the anti-slippery grip ensures a stable image, even when your hands are wet or sweaty. Apart from the actual binoculars, the package comes with a carry bag, a strap and a cleaning cloth for maintenance. What's to like about these travel binoculars? Gosky doesn't fool around when it comes to binoculars. In fact, it's known for designing some of the best travel binoculars on the market. This model makes no exception either. It's compact and weighs 1.55 pounds. 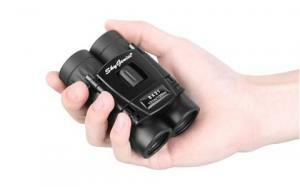 Therefore, it can't really classify as pocket binoculars, yet it's still light on the hand and offers a good grip. It comes with an anti-slippery rubber armor, so it will survive small bangs and drops, but it will also feel comfortable even if your hands are wet. It's part of a complete package that also includes eyepiece and lens covers, a cleaning cloth, a strap and a carrying case. Performance is top-notch in this unit. It has a 10x magnification, as well as a proper 1000 yard field of view. It's not just for travel, but for all kinds of outdoor activities – from watching wildlife to hiking and climbing. In order to boost clarity, Gosky has featured its binoculars with a 42mm green film objective lens, as well as a solid 18mm blue film eyepiece. You will never miss a small detail. Apart from clarity, everything looks brighter as well. If you use glasses, you can adjust the eye cup twists and look through the binoculars without taking them off. The binoculars can be connected to a tripod, yet you'll have to buy the adapter separately. It's also mountable to most smartphones, regardless of the make. If you're into photography, it will boost your pictures. This model from SkyGenius can certainly top as one of the best travel binoculars for more reasons. With just 6.2 ounces in weight, it will draw plenty of attention from occasional users. Whether you want to use it for special events or just to look around when you go out in nature, this model will fit in your hand, pocket and purse with no problems at all. Despite the small size, it will impress with its capabilities too. It has a large field of view – 1000 yards. It also comes with 8x magnification, so you won't miss a single detail. The 21mm objective diameter is more than enough to guarantee for a proper clarity, but it also allows just enough light inside. The mini focus length goes up to 2m. It has a multi FCM green optimal coat to display colors accordingly. Focusing is piece of cake. It has a smooth center knob. It might feel a bit uncomfortable at first, but it's doable. Even kids can get used to focusing. In terms of construction, there's nothing special about these binoculars. Unless you use them move on a heavy rainy day or underwater, you should have no problems with them. The unit is not waterproof, yet it can take an accidental splash. It won't slip out of your hands even if they're sweaty. The package includes a strap and a cleaning cloth. 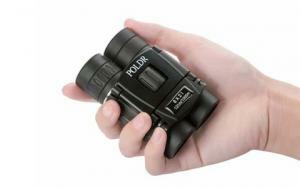 Available in three different sizes, POLDR's binoculars might look like an average unit. It has the main features and no bells and whistles. It can be used for anything – travel, but also opera, concerts, camping, bird watching and so on. It's ideal for both children and adults. It doesn't have any bells and whistles, but the main features are so well put together that you simply can't overlook this model. It weighs 6.35 ounces – lightweight and easy on your hands. You can fit it anywhere. You can even hold it with one hand over long times with no problems at all. It's anti-slippery as well, plus you can fold it for even more compactness. When it comes to performance, you can count on the classic 1000 yard field of view – more than enough for everyday activities. You'll see the whole visual field and capture small details at a glance. Its clear vision is given by the 21mm objective lens, as well as the 7x21 optics with a deep 8x magnification. Focusing on small details has never been easier. The knob is in the center of the unit. It's smooth and easy to use, despite the slightly uncomfortable position. The BaK-7 roof prism and FMC green coat guarantee for exquisite optics – quality, sharpness, brightness and contrast. The package includes a strap, a carry bag and a cleaning cloth. Merytes is known for designing some of the best travel binoculars out there. With 7.05 ounces in weight, this model may not be the smallest or most compact option out there, but it will certainly add to the overall experience. It's not that big though. It doesn't fit inside a regular pocket, but you can throw it in a purse or backpack. It's made of durable rubber, so it won't slip out of your hands. It ensures a comfortable grip even when your hands are sweaty. It is IPX3 waterproof. While it can take some splashes or a light rain, it's not recommended to put it underwater or use it in heavy rain for too long. This model comes with an all optical glass lens, as well as a top-notch FMC multilayer film. The image is sharp and clear. Colors are perfectly retrieved, not to mention the wide vision. It transmits light even in a low light environment. It's not suitable after sunset though, as it doesn't work under such low light conditions. When compared to other binoculars in this segment, this unit from Merytes has a bigger objective lens. The image is clearer and has more spaces, so your eyes won't feel too tired when watching a game or concert. It has a solid 10x, 101m/1000m vision, as well as right eye parallax adjustment for those in need. The package includes a cleaning cloth, a carry bag and a strap too. It's excellent for outdoor activities and travel, since both kids and adults can use it. As a short final conclusion, it takes a bit of research to find the best travel binoculars. Generally speaking, what works for you doesn't necessarily work for everyone else. While it does pay off to read some reviews and learn from others' past experiences, it's worth doing it with your personal necessities in mind. A decent set of binoculars can work for everyone, yet you want to stand up in the crowd. 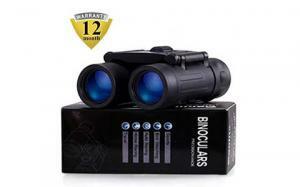 Whether this is your first set or you've used binoculars before, you want a high quality item. If it's not, you won't enjoy the experience and ditch the set in no time. Ask yourself – what do you need binoculars for? Where do you plan to use them? How often do you want to do it? How far do you want to see? Do you have any eye problems? Once you have all the answers, choosing the right item becomes a matter of time only.